Bringing Integrity to the Credit Card Processing Industry One Merchant at a Time. 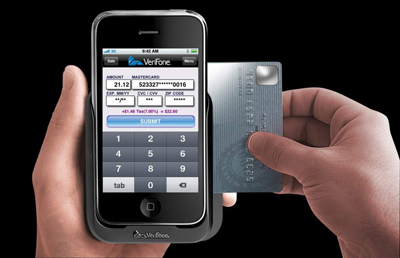 If your business is on the road and you accept credit cards or have considered it now is the perfect time to simplify your life, save $$$’s and impress your clients and competition with the smartest, coolest new device on the market! A quick download of the PAYware Mobile app to your iPhone 3G or 3GS opens the door to increased sales and margins by enabling you to accept more "card present" payments and the app is remarkably easy to use. Just swipe the card and a tone tells you the fully encrypted transaction data has been accepted, push a button to capture the signature, push another to add a tip to the bill, push one more to finalize the sale. Want to email the receipt to your customer? Click. Done. You can review previous transactions, check daily transaction summaries, even bring up a map showing where each transaction took place anytime. The PAYware Mobile credit card encryption sleeve fits any iPhone 3G or 3GS model and because it's portable, you'll reduce costs by making more "card present" sales. The sleeve's design is sturdy and compact, so it's not only built to survive the abuse that the real world dishes out, it performs flawlessly while doing so. With PAYware Connect, all it takes to manage your payment gateway is access to the web. That's it. No hardware or software to buy. No payment engine. No electronic engineering degree. What you do get is a fully customizable and utterly reliable gateway service that's ideal for small businesses that are ready to grow. Whether you have one Payware Mobile-equipped iPhone or ten, PAYware Connect consolidates all their payments into a single portal. As a result, details of all iPhone transactions are available in real-time within the Merchant Portal on the payment gateway. Reporting has never been so easy. Please complete the form below and let us know the best time to contact you for further information. Our mission is to assist business owners in choosing the best and most cost efficient form of payment processing for their needs. We will NEVER pressure or harass you in any way.